If you enjoy your cheese, ham and wine full of flavour, your fashion smart, your streets old and cobbled and your architecture dramatic, then Parma is the place for you. Most of Parma's highlights are within a leisurely walking distance of the centre of town, with just a little more effort required to reach the attractions on the far side of the river. This is where you'll come across several of the best places to stay in Parma. You'll find cycling is popular, so join in if you fancy. Otherwise, just admire the attitude of folk who'll cycle in Prada! Parma has real Italian style, in summer the air wafts with classical music - this is Verdi's home - and people sip brightly coloured aperitivos on Via Farini. In winter, there are numerous cosy cafes and restaurants in which to escape from the dazzling splendour of the white light and architecture. The Piazza Duomo with its fresco filled cathedral and pink marble baptistery - one of the most famous medieval buildings in Italy - is a good place to start your explorations. Or Garibaldi Square, where you'll find the Governor's Palace, and where the original Roman colony had its forum, if you come upon that first. Make sure you swing by the Palazzo della Pilotta, a wonderful Renaissance palace, the Galleria Nazionale and the Teatro Regio, the opera house - and see a Verdi opera if it's at all possible! Obviously you'll also want to eat. But as well as fitting in as many stops for cheese and ham as you can, it's also worth trying the local stuffed pasta. The stunning Teatro Farnese is a must see! Learn all about the history behind this perfectly preserved, all-wood theatre. The Cattedrale di Parma is a beautiful spot. Whilst it may not seem like much from the outside, the interiors are completely filled with colourful frescoes which will take your breath away. The Galleria Nazionale houses a fabulous collection of late medieval and early Renaissance paintings. Whilst most of the descriptions are in Italian, you'll be sure to enjoy the artworks themselves. Head to the Museo Lombardi - Marie Louise and Napoleon to discover more about Napoleon's second wife, the Duchess of Parma. Dedicated to the life's work of Professor Glauco Lombardi, which centred around the city, and in particular Marie Louise, it's an interesting spot to pass through. Our Guru's pick of the best places to stay in Parma are ideally placed for exploring this great Italian city. Use their recommendations and start to plan your trip now. Pio Rooms is a wonderfully characterful and intimate B&B in the heart of Parma. Their cosy, traditional rooms feature exposed wooden beams and soft lighting, whilst you can enjoy lovely breakfasts each morning to set you up for the day. Palazzo Dalla Rosa Prati is an elegant guesthouse located bang smack in the city centre. Featuring traditionally decorated and spacious rooms starting from just £80 a night, this is a top all-round city spot. 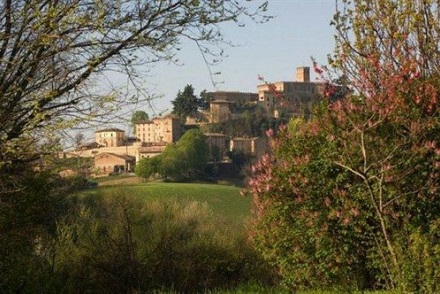 Antico Borgo di Tabiano Castello is a wonderfully romantic castle-hotel nestled in amongst Parma's hills. As well as the elegant decor, the castle has wonderful views from its numerous terraces, a pool and Turkish hammam, and an excellent restaurant serving local specialities. If you'd rather the privacy of a self-catering option then browse through the wide variety available online with our partner, booking.com. 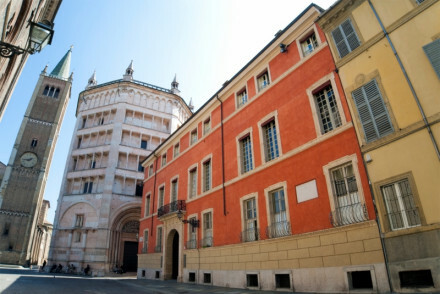 Parma is at its loveliest during the summer months, with the average temperature climbing to 25°C in July. However, this is peak tourist season and so expect the city to be busy and for accommodation to be more expensive. If you fancy visiting at a quieter time then the shoulder-season months (May and September) are great bets. The weather's still perfectly pleasant, averaging around 20°C, and you'll also avoid the large crowds. Parma International Airport is the closest airport, but if you're coming from the UK you'll need to fly to Bologna Airport, which is 93km away. You can fly to Bologna from Gatwick with Easyjet, from Heathrow with British Aiways, as well as Stansted and Edinburgh with Ryanair. From the airport, take the train from the terminal to Bologna Centrale and then onto Parma. In total this should take around an hour and twenty minutes, costing between €15-25. Browse through our list of all the best places to stay in Parma. Or, feel free to contact one of our friendly Gurus for advice. A charming and intimate B&B situated in the heart of Parma. 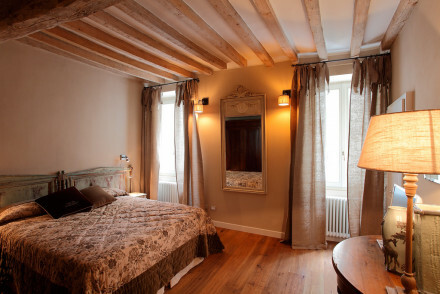 Its rooms are traditionally decorated with exposed beams, warm lighting and a cosy feel. Be sure to fuel your daily sightseeing trips with their wonderful breakfast served each morning. A quiet, chic city hideaway. Local exploring - Only a short walk away from the city's sights, you've really got no excuse not to go exploring! Elegant guesthouse featuring traditionally decorated rooms and apartments in the heart of Parma. Grab a coffee at the café before setting off for a spot of sightseeing and unwind at the end of a busy day by booking yourself a massage. Smart rooms feature colourful palettes and are great value. A wonderful castle nestled in the hills of Parma. Traditional elegance throughout romantic bedrooms. Wooden beams, stone walls, marble floors, soft linens. Stunning valley views from terraces, Turkish spa and pool, regional cuisine, and lots countryside exploring. Romantic, rustic, and laid back. Sights nearby - Mazzini Park, Salsomaggiore Convention Bureau, and Thermae Di Salsomaggiore. Spa - TERME DI TABIANO Spa.